Cow hates it when books promise so much more than they deliver. 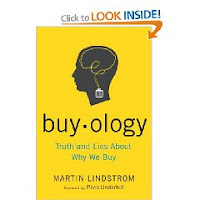 Buyology: The Truth and Lies about Why We Buy, seems so interesting. Let's use MRI using to explore the brain's reaction to advertising! - Indirect advertising in movies has no effect unless its tied into the plot. Cow has a sneaking suspicion they also tested book jacket colors, found that yellow sells fastest, and figured to get their $25 bucks before anyone noticed there was only one page of actual content. Yes, with a title that interesting you don't need much content! There was a book about grammar that sold well because its title was Eats, Shoots and Leaves. LOL! Can you get your money back? OR give it as a gift? So, you found more lies that truth? GB: Another favorite title was "Kicked, Bitten, and Scratched" about working with animals. Watercolor: luckily, this was a library book, Cow only resents the time wasted reading it, and the taxpayer expense of buying it. Since when could we not give library books as gifts? Kevin: spoken like a true librarian.